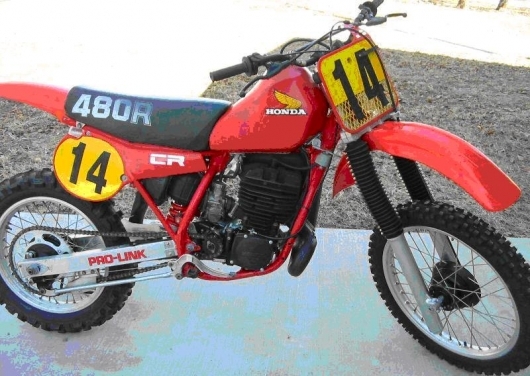 In 1982 Honda came out with a replacement for the 1981 CR450 Honda Elsinore (the last year that name would be used btw) with an entirely new motorcycle that would culminate in the 1983 model. 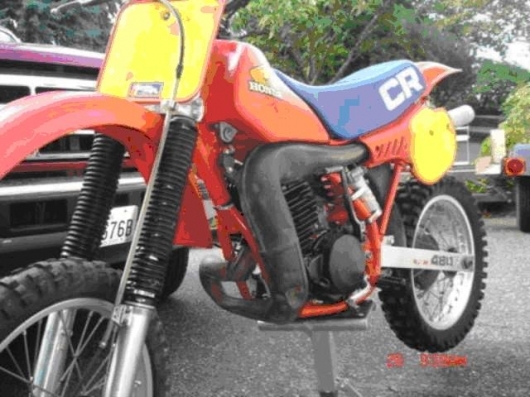 The 1982 CR480 was a kind of mediocre bike, with suspension issues caused by the inferior Kayaba fork and shock, and a 4 speed transmission. While it put out a lot of beans (51 horses) it didn’t handle that well, and had a badly spaced gearbox to boot. Honda also saw fit to put the kick starter and chain on the “wrong” side, and confused the heck out of everybody. No one seems to remember the 1982 model. 1982 CR480R Honda. Where's the kickstarter? The bike culminated in the 1983 model, with a five speed transmission, and a removable sub-frame. With a 43mm Showa forks and an adjustable Showa shock on the back, the bike now became a handler, and could outturn about any open class bike in the field. It was like riding a razor, you just thought about throwing a big foot up slide through a corner, and it happened. Instant motocross star. The Japanese open class motocross bike had arrived. 1983 CR480, 15 way adjustable Showas made the difference. Nice headpipe. Blue seat and yellow plates on the '83 model. The ’83 CR480 had a midrange hit like nothing else I’d ever felt. It also had the worst head shake of any motorcycle I’ve ever ridden, period, even with 4 inches of sag in the back. I’d be in the desert, tapped in fifth, and sometimes the bars would start to go “yow-yow-yow-yow” and I’d look for a soft place to land. Thankfully the bike would sign off at top end, run out of power, and the bars would quit wagging. Sometimes. Braking from speed also threw the front end into fits, and was design flaw if there ever was one. It did turn good though, and you could stuff the front end into a corner to square it off, with no issues whatsoever. Short shifting worked best, and used its massive mid-range punch to advantage over other bikes of the period, that all of a sudden weren’t that competitive anymore. This was the first open class Honda motorcycle that anyone took notice to, the earlier ones being flawed in one way or another. The removable sub-frame and easy to service shock and linkage made this the first Honda to offer such design, and it was little items like this that sold the bike. I was still riding a trick ’76 Bultaco 360 Pursang Jim Pomeroy Replica at the time, and could keep up with the other Japanese open bikes with no problem. Then the eighty three came out, and my Bultaco became an instant antique. I can remember one race at the ‘Dunes in ‘83, when a new Honda 480 pulled me with ease, and roosted me the whole race. It was no contest. I was so demoralized I sold the Bultaco that next week, got out of motocross and bought an ’83 XL600R Honda dual sport. I was bummed. The ’83 CR480 was deemed “still competitive” in open class motorcross up into the early 1990’s, when the open class had disappeared. 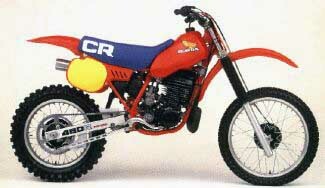 Such was the 1983 CR480 Honda, a model that got it all right the second time, and became an instant classic.